The journey begins in adventure-filled Vietnam. Competent, local, English-speaking guides take you to the main sights in the long, beautiful country, and along the way, you have some time on your own to explore or relax. 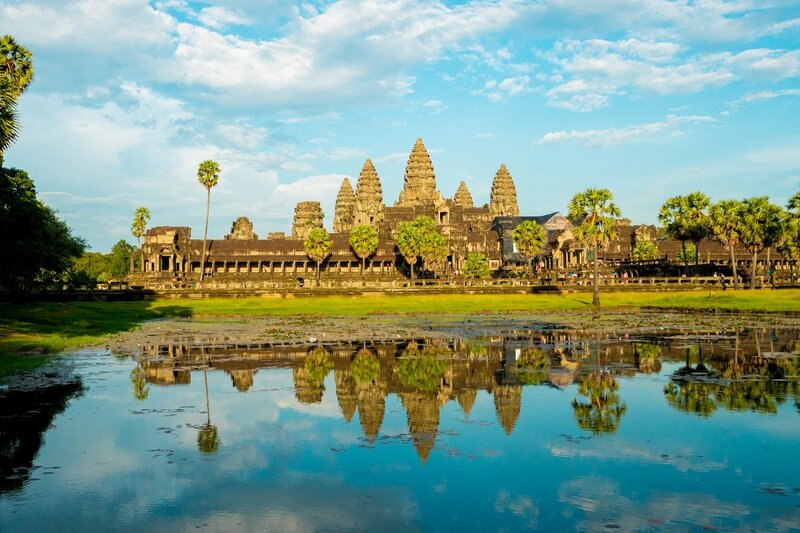 From Vietnam, you sail along the mighty Mekong River to Cambodia, where you will discover the country’s largest city and capital, Phnom Penh, before travelling to Siem Reap. A visit to Ankor Wat and the surrounding ruins will leave you with a lasting memory. 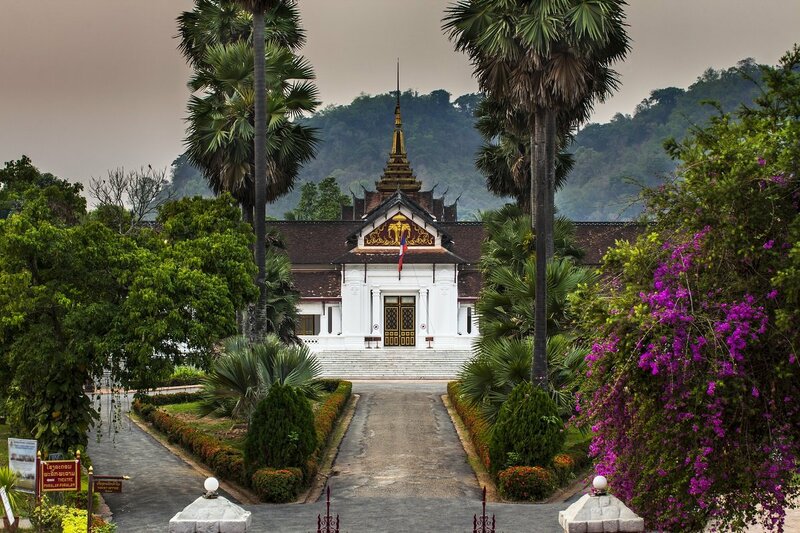 The tour ends in Laos’ old royal city, Luang Prabang. 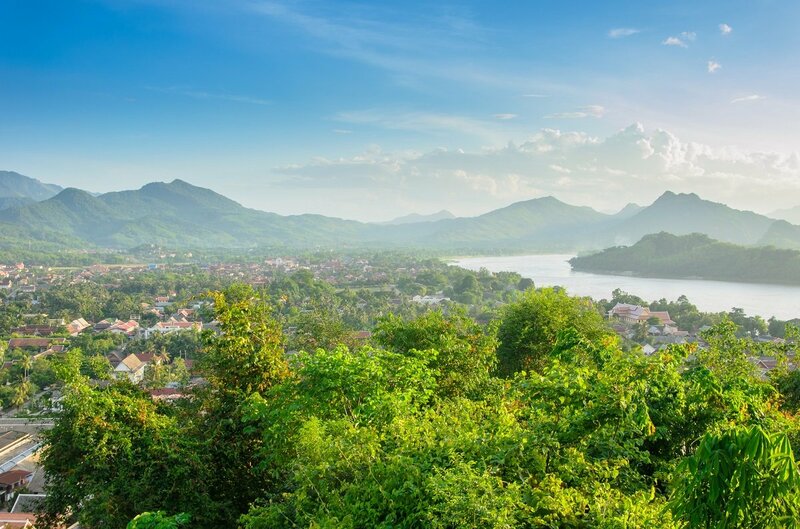 The peace, quiet and idyll of Luang Prabang is just what you need to really digest the last weeks’ experiences of the best of Indochina. Departure from the selected airport in the UK with with connecting flights along the way. After arriving in Hanoi, you go through immigration and collect your luggage. Your guide awaits for you in the arrivals hall with an Asia Tours sign. You are driven to your hotel, where you will spend the night. Once you arrive, the rest of the day is at your leisure. You could take a little trip to the small, busy streets in the exotic Old Quarter, while taking in the variety of sights and sounds of the city. Lake Hoan Kiem is close by. A walk around it takes about half an hour, and can be quite refreshing in the shade of the many big trees. After having breakfast, you check out and keep your baggage at the hotel. 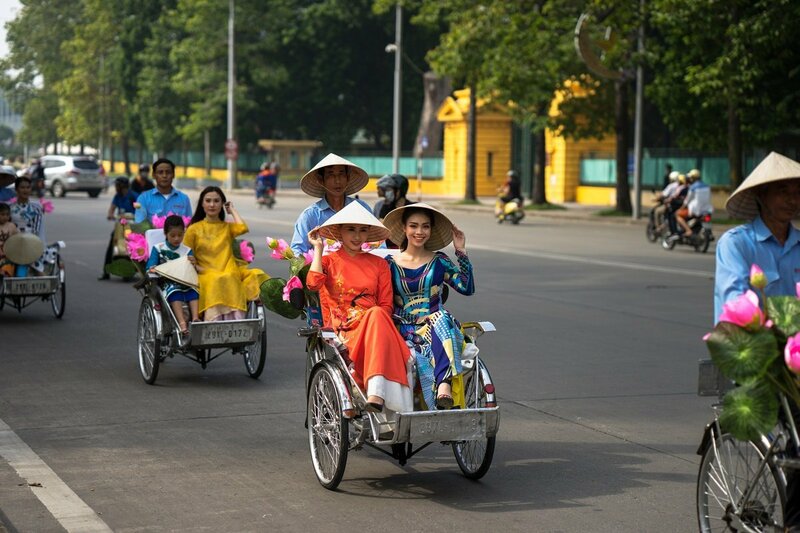 An exciting guided sightseeing tour awaits, taking you to the greatest sights of Hanoi. 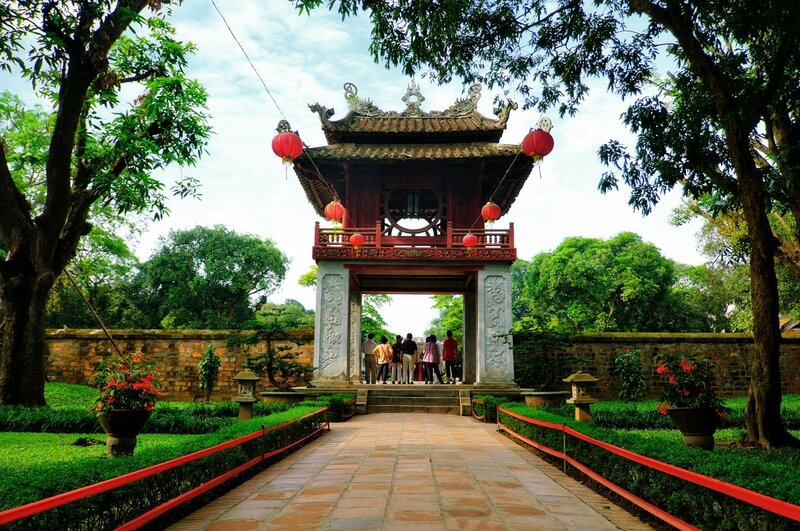 You visit the Ho Chi Minh Mausoleum, constructed in honour of the first president and father of the republic of Vietnam, who spent most of his life living and working in Hanoi. 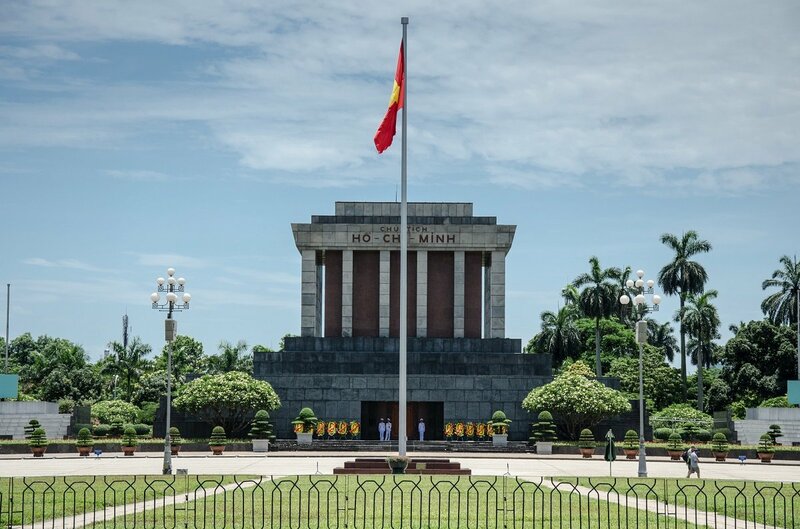 Please note that the Ho Chi Minh Mausoleum is closed every Monday and Friday, and is completely closed in the entire period from the beginning of September to the start of December. Following a traditional Vietnamese breakfast, a visit to the imperial citadel Thang Long is next. For 13 centuries, the citadel was a centre of political power, and today it is recognised as a world cultural heritage site by UNESCO. 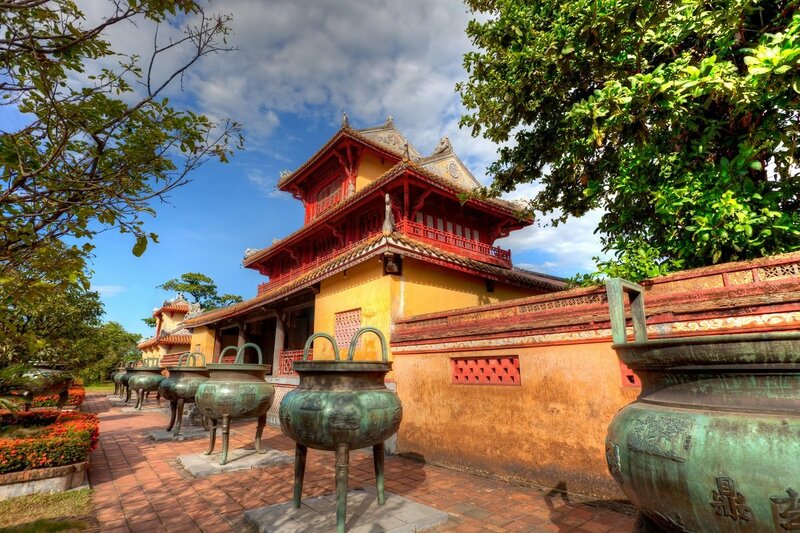 You also visit the Temple of Literature, Vietnam’s first university, dating back to the year 1070. Here the nation’s powerful officials, the Mandarins, were educated in accordance with Confucian teachings. Finally, you also see the iconic Long Bien Bridge over the Red River, getting a half-hour cyclo tour through the narrow, chaotic streets and squares of The Old Quarter. The day is finally complete when you enjoy a cup of Vietnamese coffee at a local café with a view of lake Hoan Kiem. At the end of the day, you return to your hotel and collect you bags. 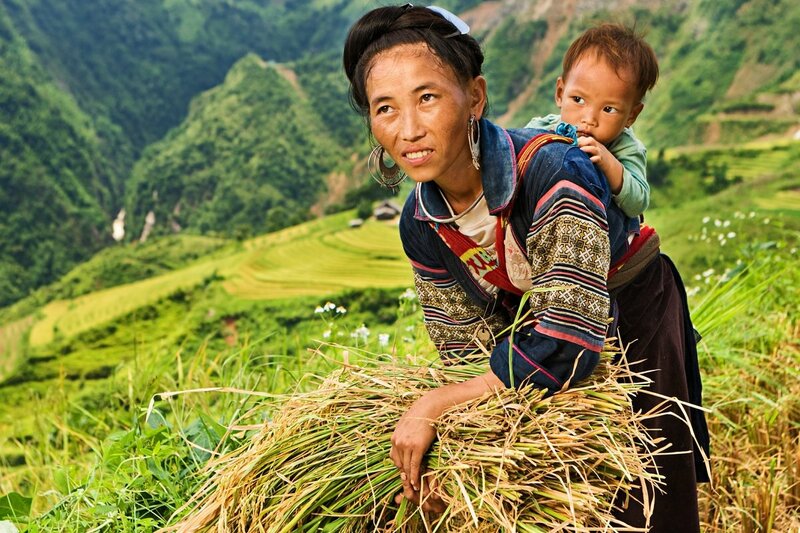 The guide then drives you to the train station , where you take the night train to Lao Cai. 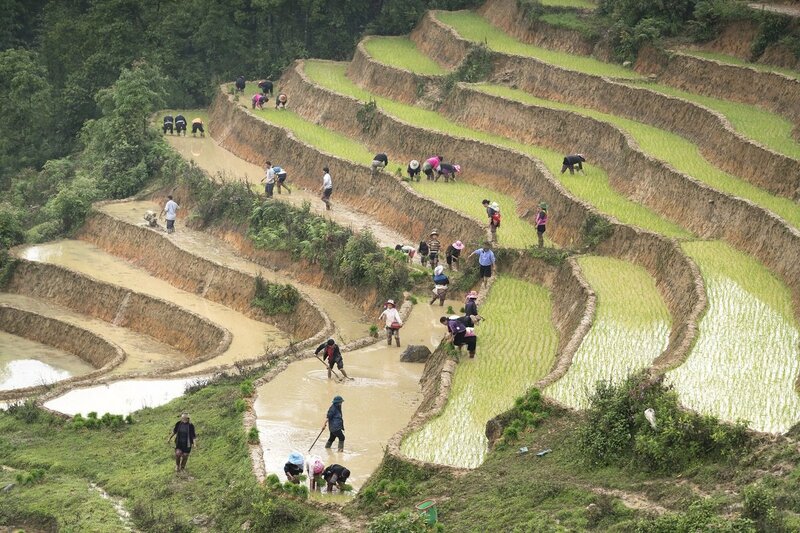 The night train departs from Hanoi at 10 pm and arrives in Lao Cai at 6.20 am the next morning. You arrive in Lao Cai early in the morning. 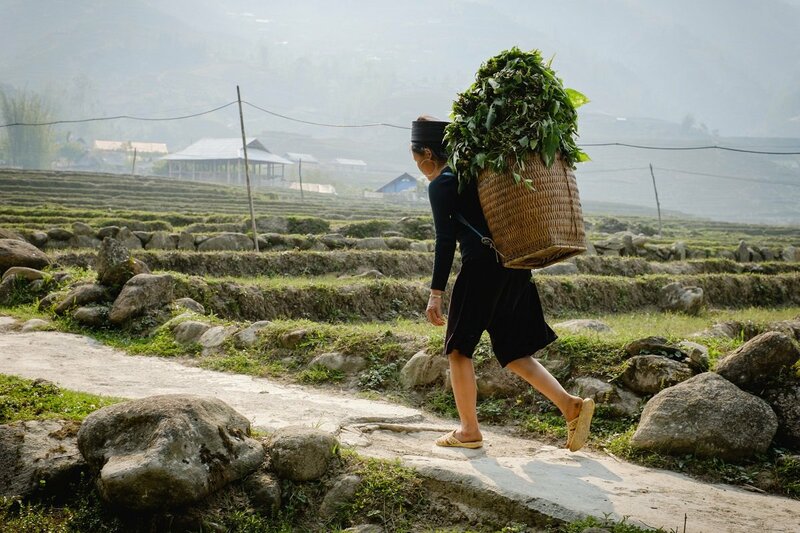 You are met by a guide who will drive you the rest of the way to the hotel in the small mountain village of Sapa, where a hearty breakfast awaits you. The drive takes around 75 minutes on small roads with hairpin bends. Your room is ready for you the moment you arrive, so you can take a bath and unpack at your leisure. 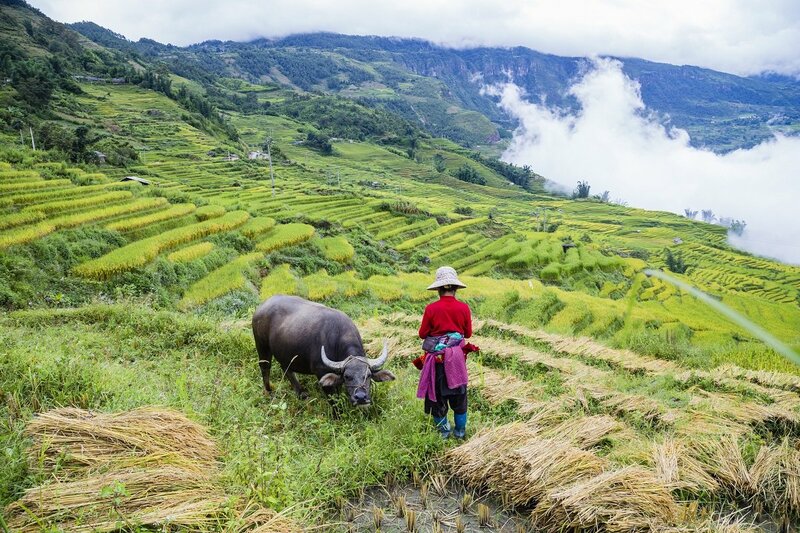 Sapa is world-famous for its scenic nature, with grass-green, painstakingly-planted rice terraces, mountains and ethnic mountain tribes in colourful clothing. In the afternoon, you are picked up by the guide and driven to the small village of Ta Van, scenically located in the Muong Hoa valley. Here, a scenic hike begins to the village of Lao Chai, which is inhabited by the black hmong minority. Be sure to wear comfortable, non-slip shoes, as the trails can be slippery in wet weather. On the hike, you will experience the local life at close range. You might, for example, see men building houses, women embroidering and children playing or on their way home from school, and who greet you with a big smile when they see you. 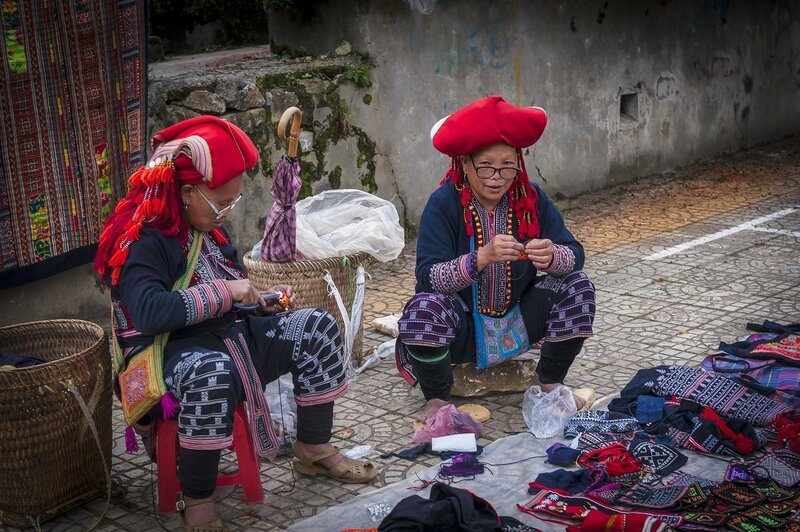 The Hmong are famous for their colourful clothes, and here in Lao Cai you are introduced to Batik and have a chance to try your hand at the craft. 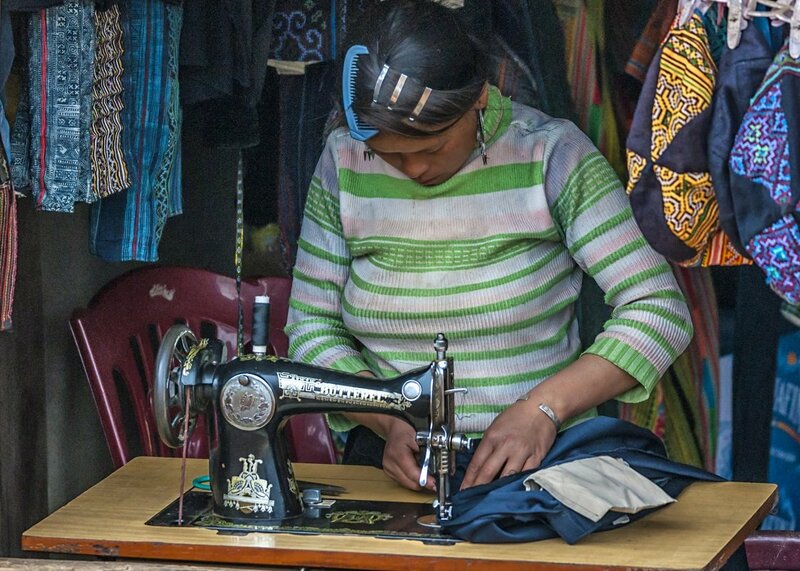 As a craft, Batik has been threatened by modern means of production, but local initiatives such as this one in Lao Cai ensure that the tradition is passed on, so that it won’t become a distant memory. The tour continues up a steep path between the rice terraces set out over the hillside slopes. You will see farmers ploughing their fields with their oxen. You arrive at Mrs Moo’s house. Mrs Moo never learned English at school, but speaks it fluently. She lives with her husband and children and runs a homestay. She tells you about life up here in the mountains while you rest your feet in a traditional herbal foot bath. Although she leads a simple life, it’s hard not to be a little envious of her view. After a pleasant visit with Mrs Moo and her family, you head back to Sapa. The day is spent at your leisure. You can choose one of our optional tours, go for a walk in the outskirts of the city or explore the small mountain village on your own. The main street runs through the village, lined with shops, restaurants and cafés. When you reach the end of the road, you come to the local square, Quang Truong, where the catholic church is located. The square is a place where the locals often meet to hang out and play ball. Quang Truong also serves as a marketplace where the ethnic tribal people come to sell their wares. On a clear day, you can enjoy a view of Vietnam’s highest mountain, Fansipan, its top often shrouded in clouds or fog. Weather-permitting, you can take the world’s highest and longest cable car up to the mountain. You will have the feeling of gliding through the clouds while enjoying the magnificent views of the Muong Hua Valley and the beautiful scenery of the Hoang Lien National Park. In the evening you will be picked up and driven to Lao Cai, from where you will take the night train back to Hanoi. The night train departs from Lao Cai at 9.20 pm and arrives in Hanoi at 5.10 am the next morning. You arrive in Hanoi very early in the morning and are picked up at the train station. From there you are driven to a hotel, giving you a chance to relax and take a bath. After breakfast, you head on – this time, towards the Ha Long Bay. The Ha Long Bay is one of Vietnam’s most unique nature areas. Hundreds of green-clad limestone cliffs protrude from the sea almost vertically, and the water below shifts between deep blue to jade green over the course of the year. Many of the islands have large grottos. On the large Cat Ba island, there are several villages, some of the smaller islands have smaller fishing villages as well. 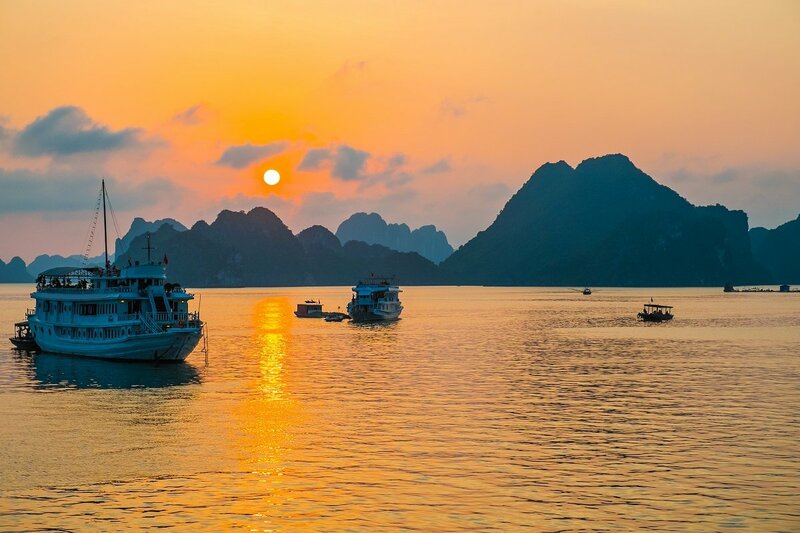 To tourists, the Ha Long Bay is primarily a world-class, gorgeous nature area, but to the Vietnamese it is also linked with legends of dragons and drama. The Ha Long Bay is approx. 1500 km² and was added to the UNESCO world heritage list in 1994. 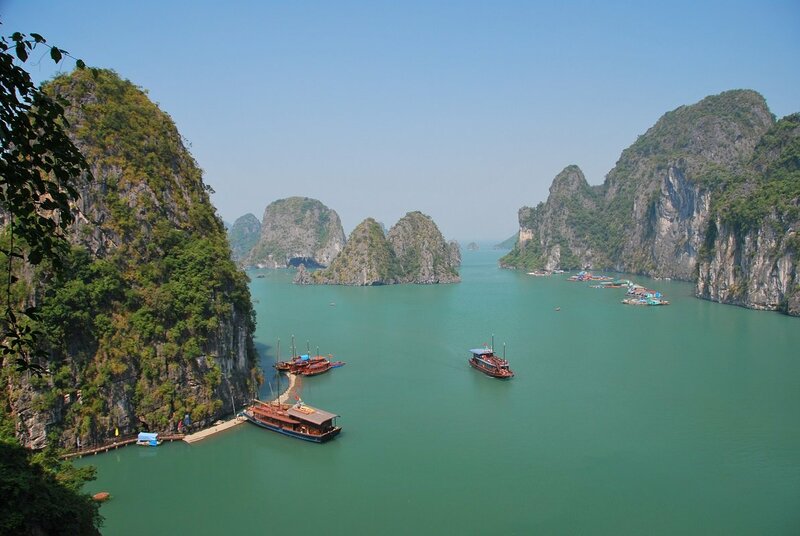 You are going on a mini-cruise in the Ha Long Bay. The boat sets off for the secluded islands out in the bay, letting you take in the beautiful scenery of the sea and beautiful isles. You can also experience life in a fishing village. You can also choose to just relax completely and enjoy life, the view of the islands and the floating fishing villages, perhaps sneaking in a swim in the turquoise water. 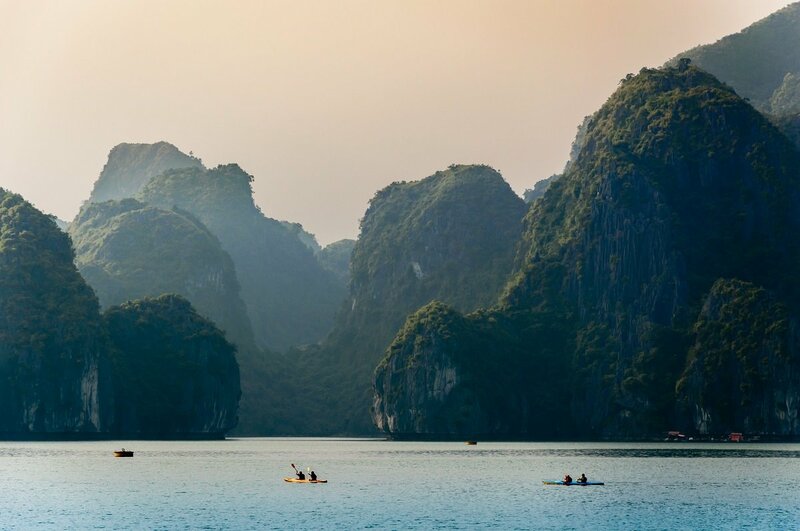 NB: In the event of inclement weather or storms, the Vietnamese authorities reserve the right to bar travel in the Ha Long Bay for safety reasons. This happens a few times a year. In this case, the mini-cruise will be replaced with a hotel stay and an excursion in Hanoi. Extra excursion: How about a bird’s-eye view of Ha Long Bay? This magnificent bay is a truly beautiful sight from above, and an aerial view will give you an excellent impression of the sheer size of the area, as well as the chance to admire the numerous limestone islands and islets towering majestically above the water. 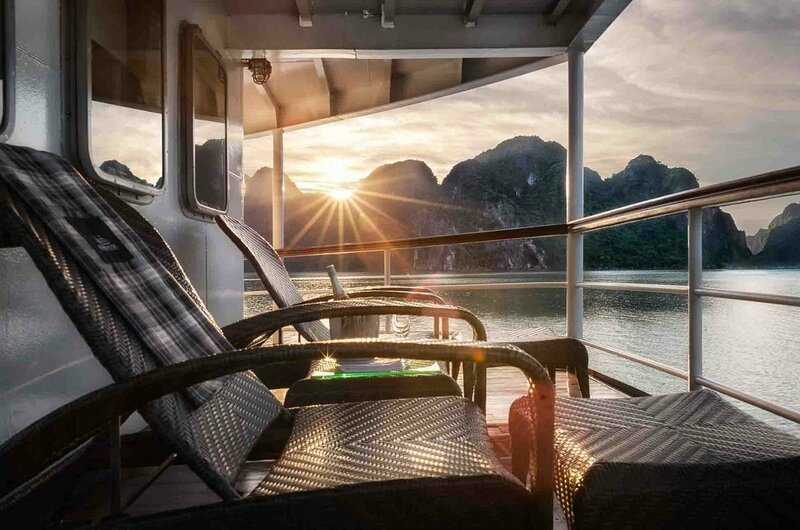 Start the day with a refreshing dip in the warm, clear water of the Ha Long Bay, or perhaps you’d like to enjoy the sunrise from the ship’s magnificent sun deck. Breakfast is served as the ship calmly begins to make the trip back to port. On the way, there is still time for a visit to a grotto featuring both stalactites and stalagmites. Once you reach land, the trip continues by car back to Hanoi, then by plane to Hué. In Hué you are picked up at the airport and driven to your hotel. The rest of the day is your own. 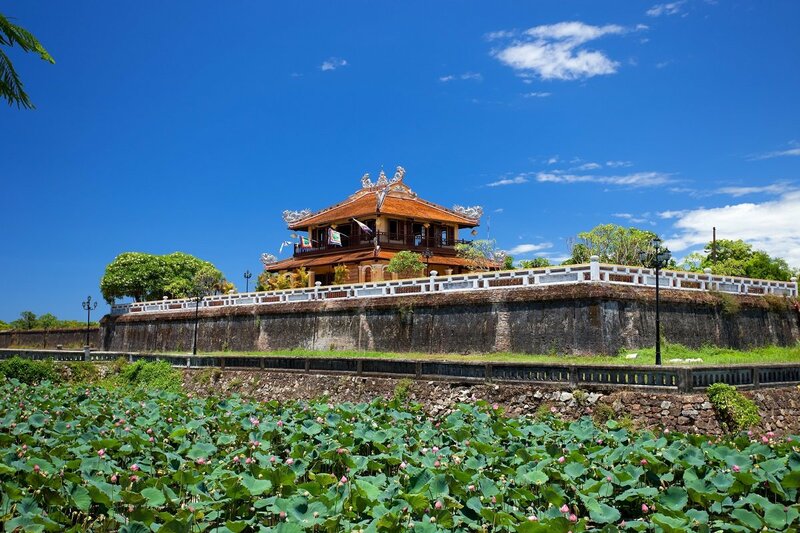 Hué was the capital of Vietnam from 1802 to 1945, and the ruins of the city’s royal past can still be experienced in the Citadel and the Imperial City. Today you visit the citadel. 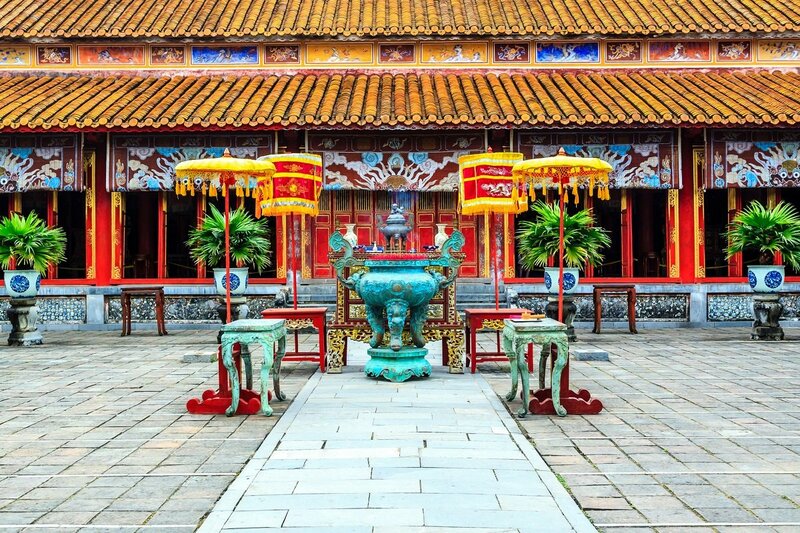 Built at the beginning of the 1800s, it was modeled after the Forbidden City in Beijing. 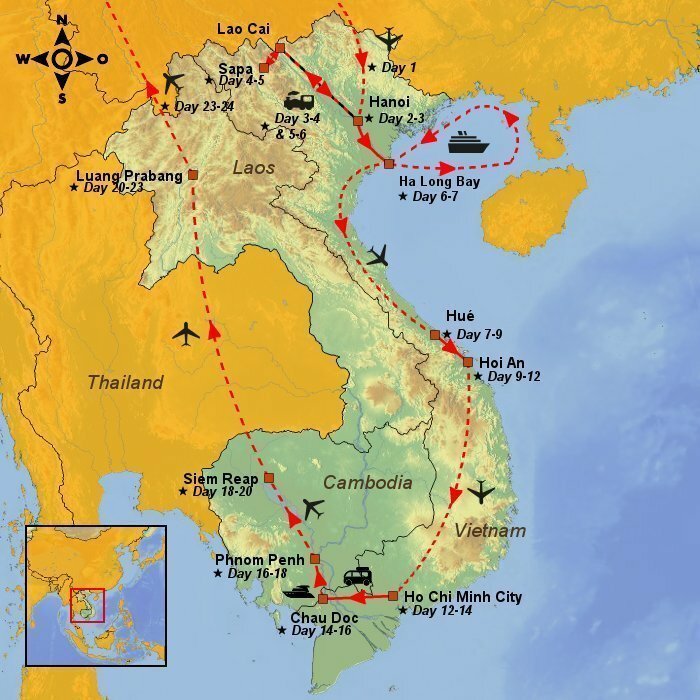 During the Indochina War and later, in the Vietnam War, many of its buildings were damaged by bombs. Today the area is being restored to its former glory with the aid of UNESCO donations. The sightseeing tour also includes visits to the impressive imperial tombs, and concludes with a sail trip on the Perfume River. The afternoon is at your disposal. In the morning you drive a charming route from Hué to Hoi An. 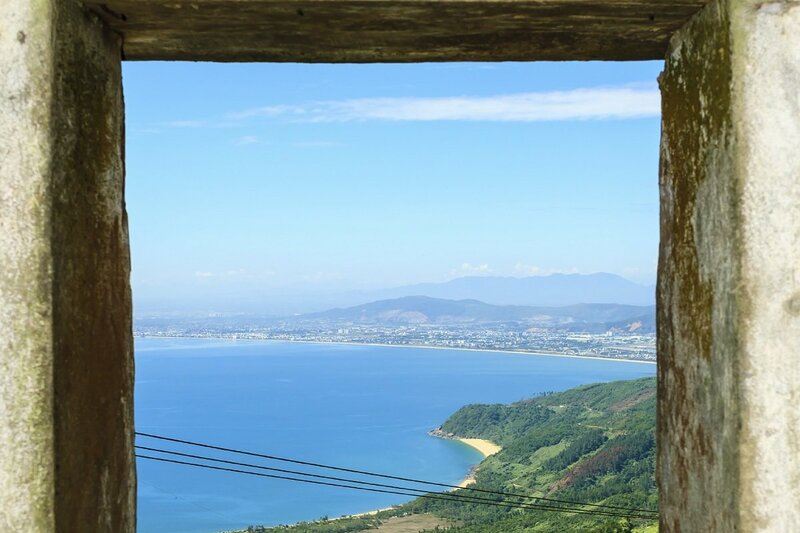 The route goes along the coast part of the way, then passes over the Truong Son mountains and through the world-famous Hai Van Pass, also known as “the pass in the clouds”. You arrive at Hoi An in the late afternoon. 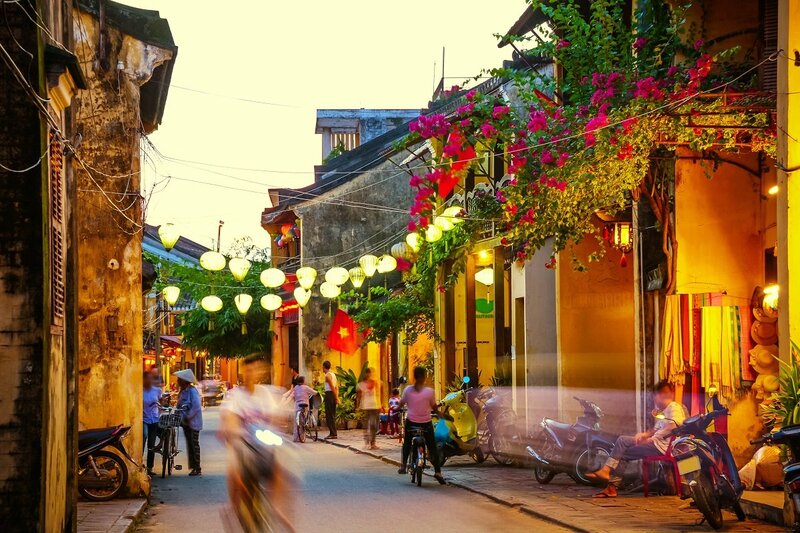 Hoi An is a wonderful experience and you cannot help but fall in love with the city. It is especially well-known for its charming architecture, impressive silk production, great tailors and its Old Town, which is a UNESCO World Heritage Site. Flowing through the heart of the Old Town is the Thu Bon River, which is a glorious example of an international port dating back to the heyday of European and East Asian trading companies from the 16th to the 18th century. Away from the river, you will find yourself in a maze of cosy, charming streets. Wherever you turn, you will see how the former colonial powers have each made their mark on the district. Colourful lanterns, Japanese houses, Chinese temples and French yellow merchants’ houses fill the cityscape. Shops, street kitchens, cafés and restaurants line the streets, where you can while away several hours connected to the city’s free Wi-Fi. 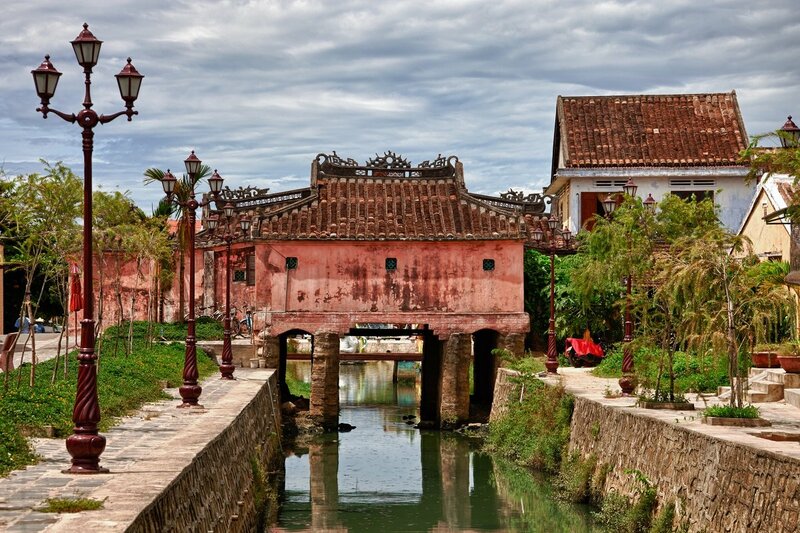 The fact that Hoi An’s Old Town is a UNESCO World Heritage Site naturally makes it a major draw for tourists. The streets might be busy, but there is still a lovely calm to the area, and the district has managed to retain its authenticity and charm. It also helps that cars, scooters and motorcycles are denied access. You spend three nights at this wonderful gem of a place, giving you plenty of time to enjoy and explore different parts of the city. The days are spent at your leisure. Enjoy the beach, explore Hoi An, make an excursion to the temple region Cham, your options are many. Today, you will be picked up from your hotel and driven to the airport in Danang, before flying to Vietnam’s biggest city Ho Chi Minh City. On your arrival at Ho Chi Minh City Airport, you will be met by a guide who will drive you to your hotel, which is located in District 1. District 1 is still known as Saigon and is considered to be the inner city, while District 2–11 is called Ho Chi Minh City. The day is spent at your leisure, and you can explore the city on your own or you can choose to purchase one of our extra excursions. It might be something of a shock to come from the peaceful Hoi An to this hectic metropolis inhabited by some 10 million people and just as many scooters and motorcycles. Fortunately, you will be rewarded with an incredibly exciting and modern city. This is seen in the city’s buildings, which are a good mix of old and new – modern high-rise buildings in glass and well-preserved colonial buildings. 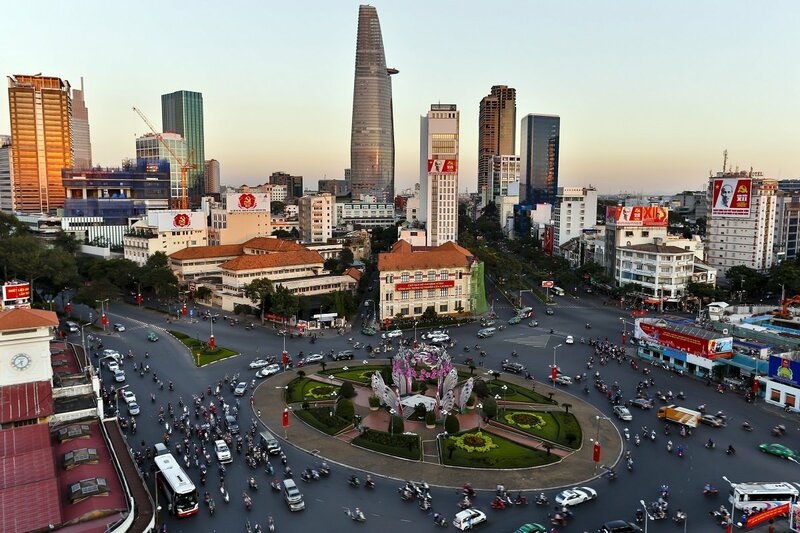 At your hotel, you are not far from the famous Ben Tranh Market, modern shops and shopping malls as well as the city’s many attractions such as Notre Dame Cathedral, the Central Post Office, Reunification Palace, the War Museum, the Opera House and the Saigon Skydeck skyskraper, from which you can look out over the whole city. 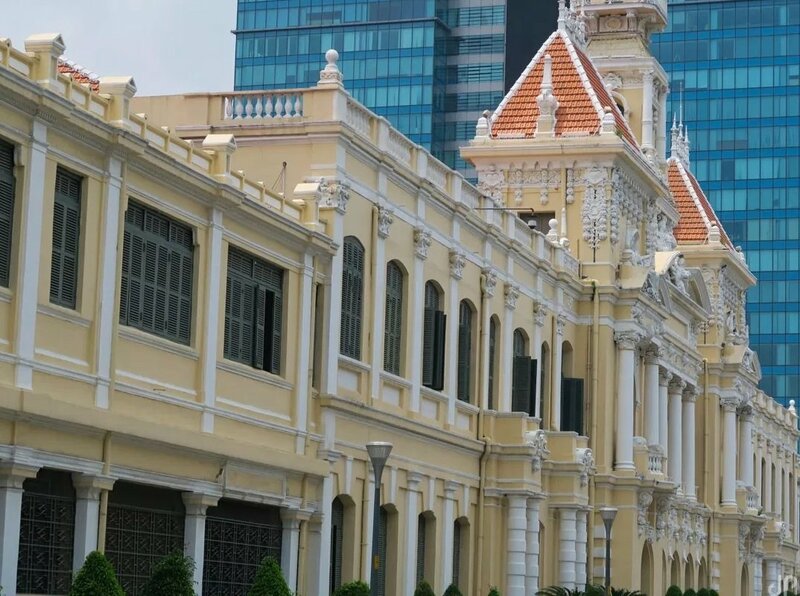 You spend the day at your leisure in Ho Chi Minh. You can choose to explore the city on your own – take a look at the various markets or eat your way through the delectable street kitchens. 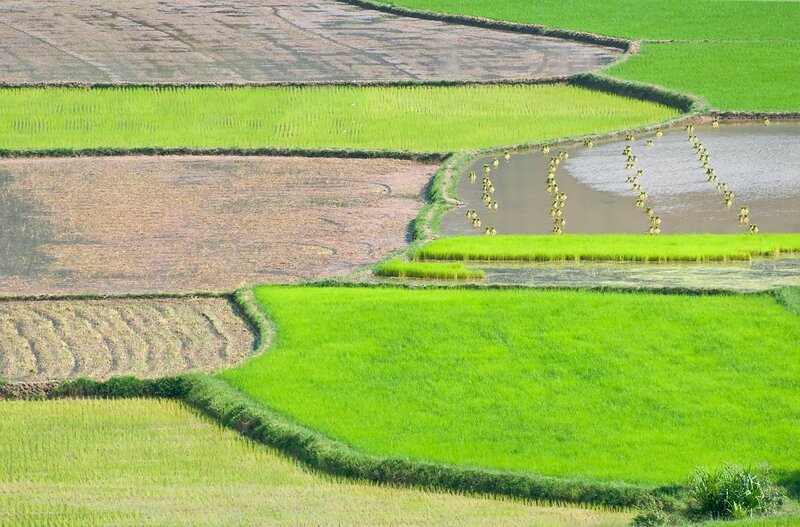 You will be picked up from the hotel and driven south, where you will soon see green rice fields. The climate here allows the farmers to plant and harvest three crops a year. 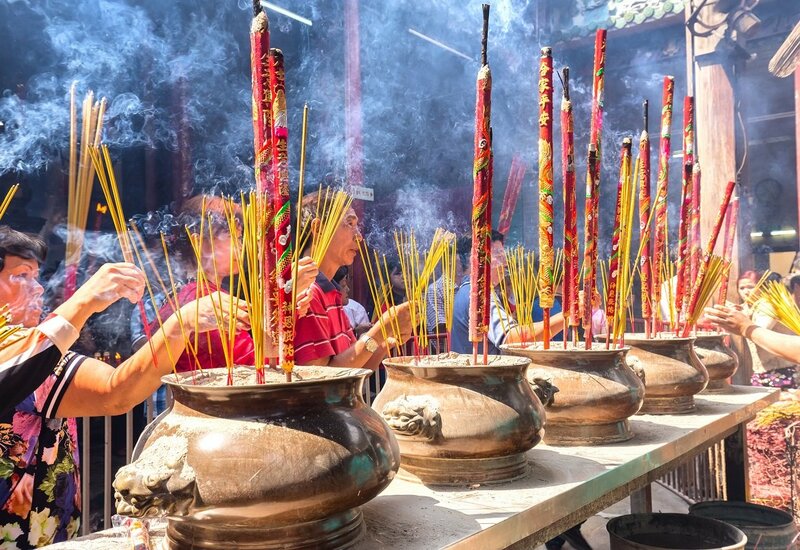 Before you reach the Mekong Delta, you will visit the local temple, Cao Dai, which is home to a religion that combines Confucianism, Buddhism, Taoism and Christianity. 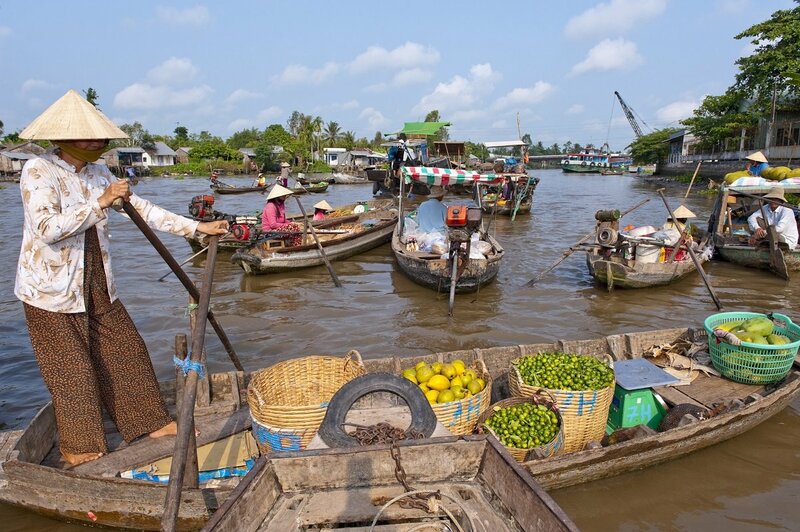 You then arrive in the charming town of Cai Be, which was once famous for its floating markets on the Mekong itself. From its source, the Mekong River runs 4,500 km through six countries to the delta at the coast to the south of Ho Chi Minh City. 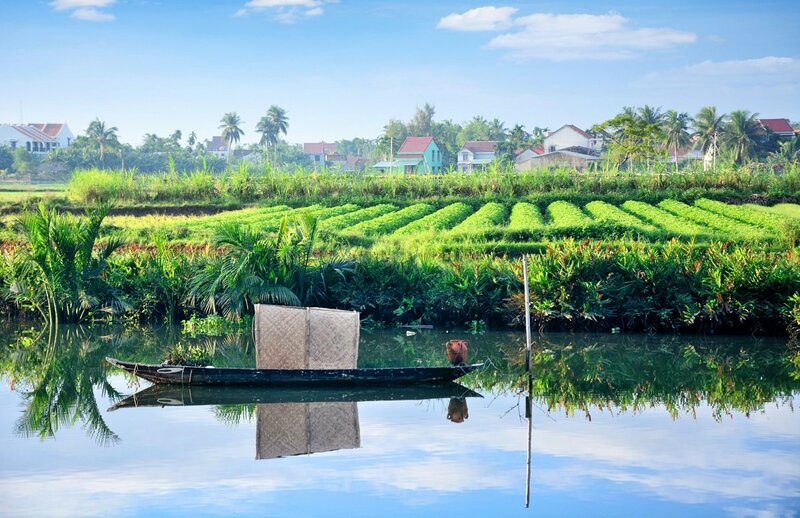 The delta is known as the rice bowl of Vietnam and is – as the name suggests – a lush place, covering an area of about 40,000 m². The size of the area covered in water depends on the season and precipitation. In Cai Be, you board a private boat, which sails you around the delta. Along the way, you will see the locals fishing and selling their wares on land. You may also see locals sailing past with watermelons, coconuts and pineapple. You sail on through the narrow canals between the green coconut palms, also known as water coconut trees. You arrive at a small rice paper factory, where you see how it is made from scratch. The day continues with a walk around the village, giving you a feel for how the locals live. You will visit a family that makes roofs out of coconut leaves, and other people who weave everything from blankets to bags and table mats. You board a sampan, which is a traditional boat, and sail further down the charming delta before enjoying a late lunch at a local house. 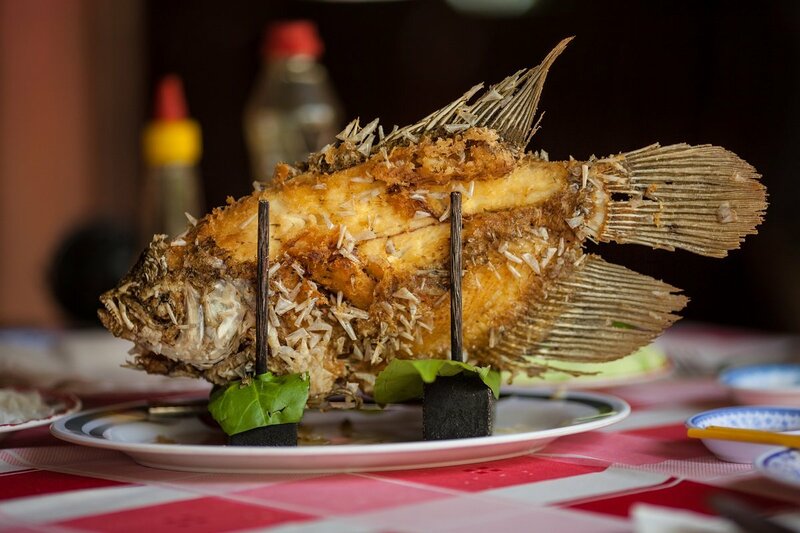 You are also given a demonstration of how to make one of the most popular Vietnamese specialties, banh xeo, a Vietnamese pancake typically filled with vegetables and fresh herbs as well as meat or tiger prawns. In the mid-afternoon, you reach Vinh Long and drive a good 4 hours to Chau Doc. Here you are up close to the Cambodian border – and deep within the Mekong Delta. You spend the morning at your leisure. Visit the local market, or some of the city’s temples, mosques or churches. Chau Doc is a melting pot of diverse cultures, living in peace and harmony on the banks of the Mekong Delta. 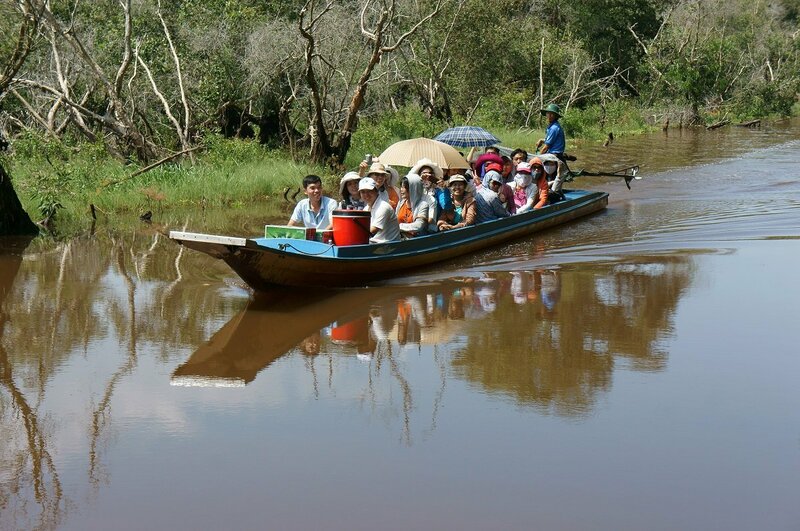 In the afternoon there is a boat trip through some of the countless channels and mangrove forests, passing small villages. Keep an eye out for birds and bats, and take in the life on the delta. Perhaps you can make a good trade with one of the various merchants sailing around the delta? You also visit a local Khmer village, setting a course past the local temple. 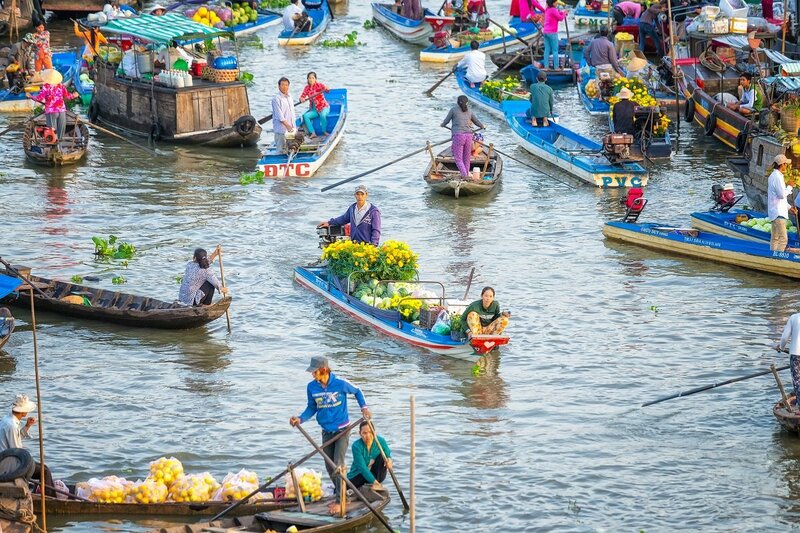 From Chau Doc, a speedboat trip takes you along the mighty Mekong River. Today’s destination is Phnom Penh in Cambodia. The trip, which takes 4–5 hours, is in a comfortable speedboat. Along the way, you can observe the life along the banks of the river. Visas to Cambodia are obtained at the border, and the boat staff help to ensure that the process runs smoothly. On your arrival in Phnom Penh, you are met and driven to your hotel where you will spend two nights. Today, a guided sightseeing tour of Phnom Penh awaits you. 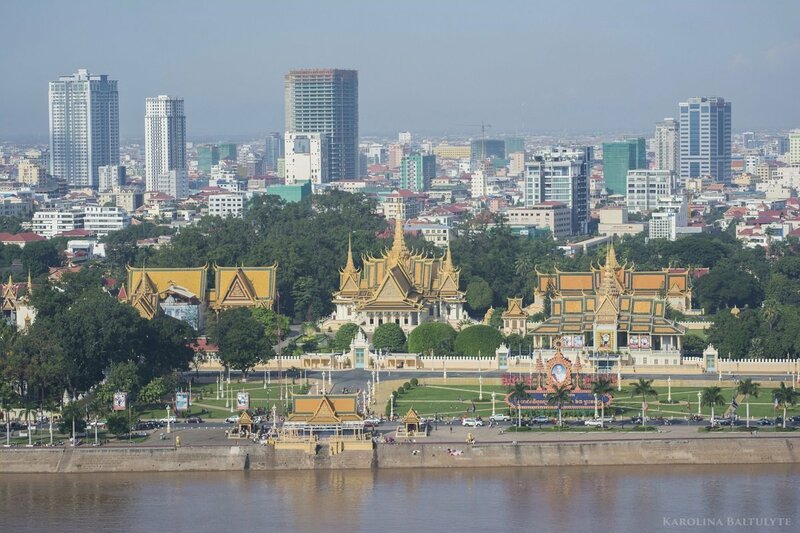 Not only is it Cambodia’s largest city, but it is also the country’s capital. The day begins with a visit to the royal palace. The palace was built in 1866, when the king moved his court from the city of Udong, which is situated roughly 40 km north-west of Phnom Penh and made Phnom Penh the capital of Cambodia. The palace is built in classic Khmer style, and is certainly one of the most beautiful sights in the entire city. 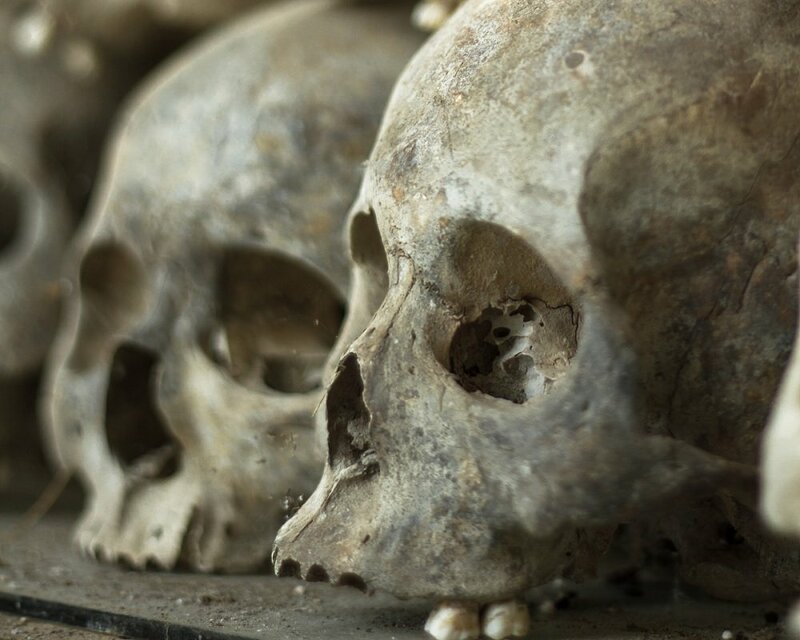 The tour then heads to the Tuol Sleng Genocide Museum, which serves as a testament to the crimes of the Khmer Rouge. Some may find the visit a harsh experience, but it is important to remember that the museum conveys a historical reality for Cambodia. Today’s tour ends with a trip to Choeung Ek, known worldwide as the “Killing Fields”, where more than 17,000 people were murdered and thrown into the mass graves by the Khmer Rouge. Late in the day, the tour heads back to the hotel, and you have the opportunity to explore Phnom Penh at your leisure in the evening. You are picked up from your hotel and driven to the airport, from where you fly to Siem Reap. 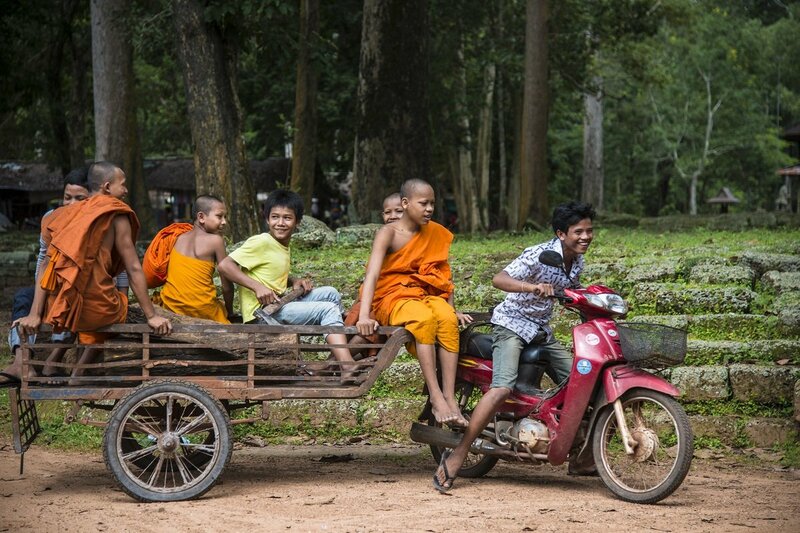 On your arrival in Siem Reap, you are met by a guide, who drives you to your hotel. You spend two nights in Siem Reap. The rest of the day is yours to relax or even explore Siem Reap. Today’s sightseeing tour takes you to one of the absolute highlights of Cambodia and the tour: Angkor’s magnificent temple complex. The area became a UNESCO World Heritage Site back in 1992. You start off at the south gate at Angkor Thom. You walk along the old city wall to see the temple ruin, Prasat Chrung. From there, you continue to the Bayon Temple, where you are greeted by ten smiling Buddha faces. 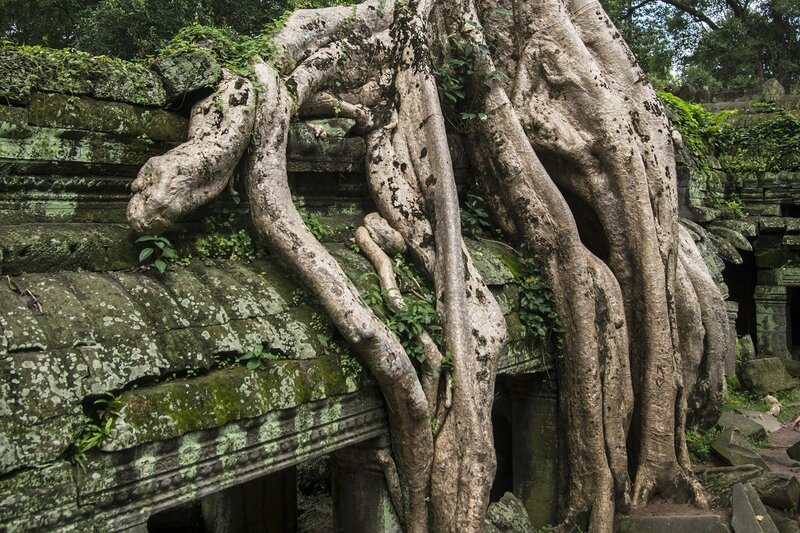 You will also see the Elephant Terrace and the royal palace Phimeanakas and finally the famous Ta Prohm Temple, known for its many ruins, where the roots of the trees have fused with the buildings to a certain degree, holding the buildings together. After lunch in Siem Reap, the tour heads to the best-preserved and most famous temple in the entire Angkor area, namely Angkor Wat. You explore the area, both with a guide and on your own, before going to Phnom Bakheng or Pre Rup to watch the sunset. You guide fetches you from the hotel and drives you to the airport. From here, you fly to Luang Prabang, where you are met by another guide, who takes you to your hotel. You spend three nights in Luang Prabang. The rest of the day is your own to start exploring Luang Prabang. The city is on UNESCO’s list of sites worthy of preservation, and is a truly unique blend of traditional Laotian architecture and French colonial era charm. The city’s rhythm is a chapter in itself, life is lived quietly and with a dignity rarely seen. Today, you are going on a guided sightseeing tour of beautiful Luang Prabang. 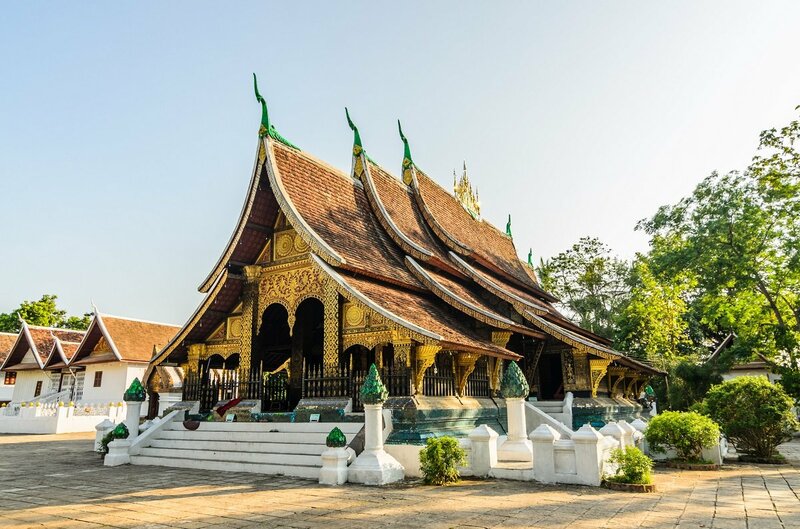 At the iconic Wat Xieng Thong temple, you will see a beautiful, traditional temple construction, but with a richly carved entrance covered in gold leaf. You also visit the National Museum, which is situated in the former royal palace. The contrast to the royal palace in Cambodia’s capital is striking. No visit to Luang Prabang is complete without standing on the top of Phousi Hill, after a climb of 328 steps. At the top, you can enjoy outstanding views of the city and the river. Later in the day, you sail along the Mekong River to the sacred Pak Ou Caves. The caves are home to hundreds of Buddha statues in all manner of sizes, and are sacred to Buddhists. The trip to and from the caves is a wonderful experience in itself. Enjoy the beautiful scenery and the wind in your hair as the local life passes by. On the way back to Luang Prabang, you make a stop in a small local village. You are back in Luang Prabang late in the day and the evening is at your disposal. Today, you’ll be getting up early! 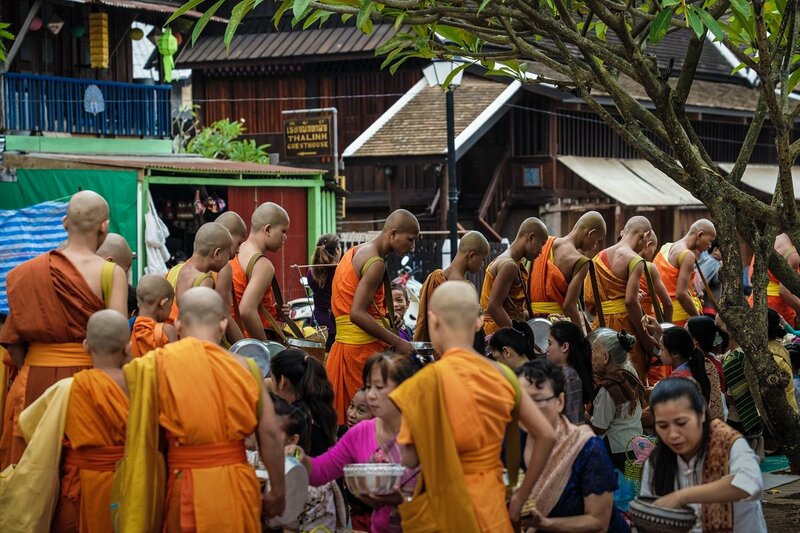 A very special experience in Luang Prabang takes place in the early hours of the morning, when 300+ monks proceed silently through the streets of the city to collect alms. All families send a representative onto the street with food or drinks, which is shared between the monks’ collection pots. As a spectator, you will be amazed by the respectful silence and great dignity with which this daily ritual takes place. 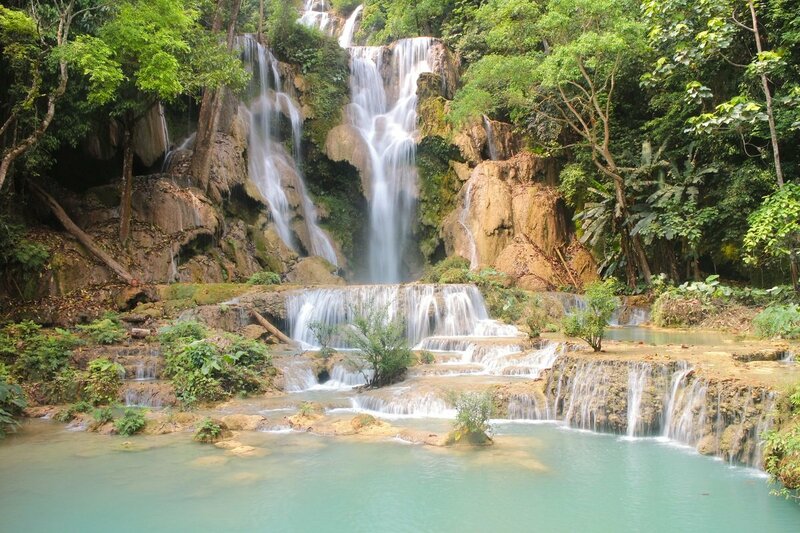 The rest of today’s experiences are located south of the city, where the crystal clear waters of Kuang Si Falls await you. At the base of the waterfall, a number of natural pools have formed, which you may swim in if you wish. By the waterfalls, there is also a centre for the beautiful Malay bears, which are a highly endangered species. This is partly due to the disappearance of their natural habitats, and partly because the bears are hunted for their bile, which is used in Chinese medicine. The rest of the day is your own to explore Luang Prabang. You are driven to the airport where you catch a flight to the UK, with connecting flight(s) on the way. Join this adventurous tour and experience the best of Vietnam. 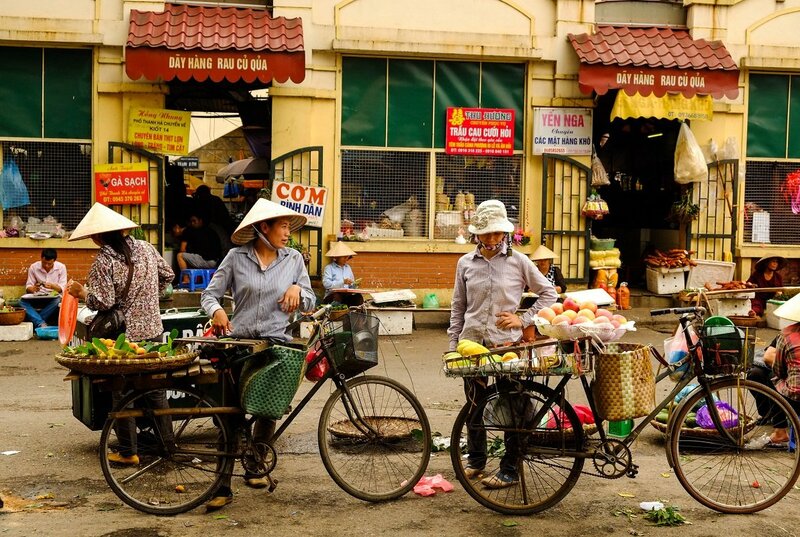 The tour takes you to both Hanoi, Sapa, Ha Long Bay, Hué, Hoi An, Ho Chi Minh City and the Mekong Delta. 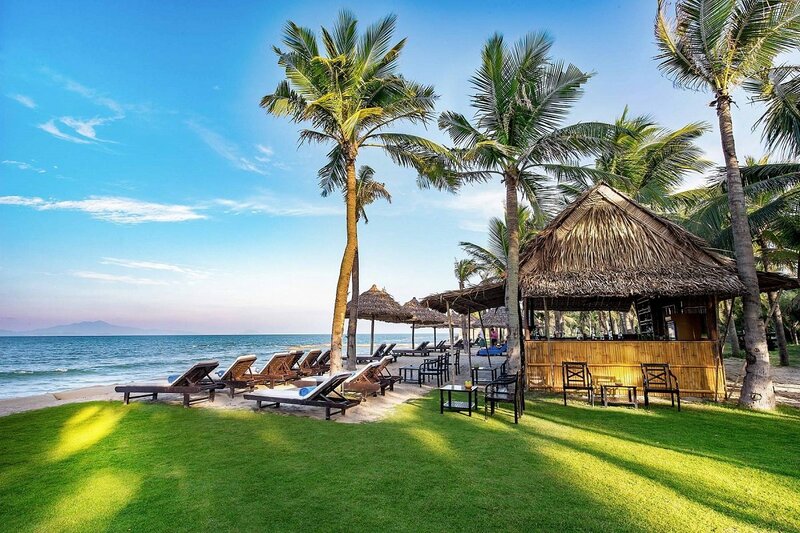 Go exploring in the metropolis of Ho Chi Minh City and finish up with a bathing holiday in beautiful Phan Thiet. Experience the classic sights and attractions of Vietnam presented by skilled, local, English-speaking guides. 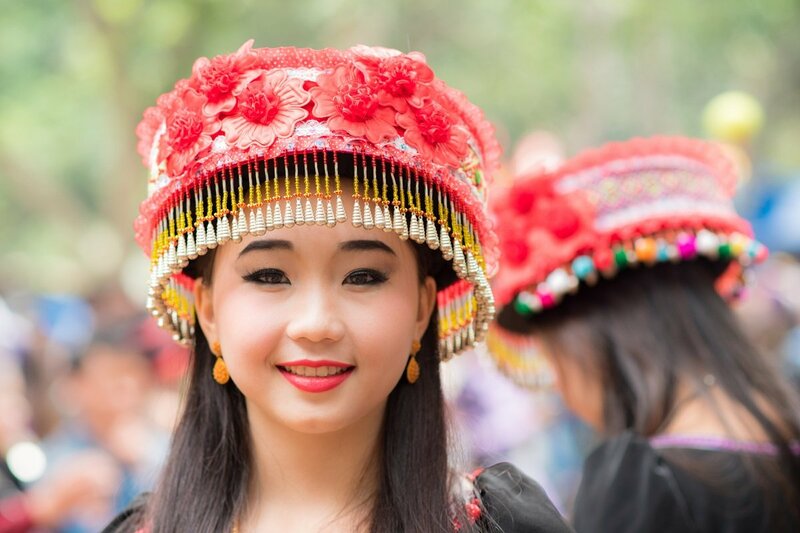 Magical nature and culture of North Vietnam, followed by a wonderful beach holiday.